So the cat got into a fight a couple of nights ago. We were merrily being couch potatos of an evening (as you do) when the cat appeared from the back garden. He sat in the doorway of the room we are temporarily using as our living room, looked at us for a moment with that expression of pity all cats are capable of, and started licking himself. He didn’t stop, though. At some point we got up to check and noticed a trail of blood terminating at the cat and leading back to the bedroom. After checking him over (three claws have been damaged, one of which had been bleeding but had stopped by the time we realised something was up) we followed the drips of blood (splattered over our brand new floor, I must add) and it led us to the window the cat had clearly jumped in. There wasn’t anything alive (or dead, though looking for the corpse of something our cat had a fight with is giving the cat a bit too much credit) outside so we’ve no idea if this was the cat being a clutz or the cat being attacked, but our money is on the latter. After a day the claw on his front paw hadn’t properly healed. He kept licking it, too, so suspecting infection we rushed him off to the vet. They confirmed our suspicions and gave him a shot and a cone of shame. 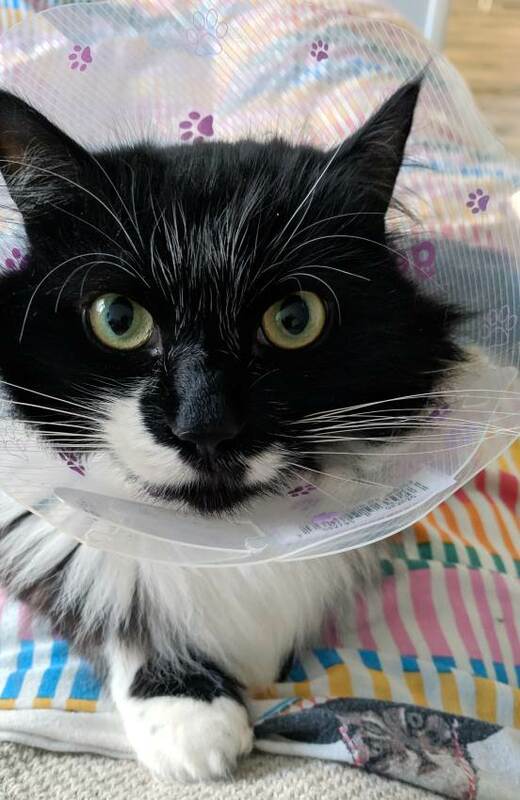 Since getting the cone he has become exceedingly affectionate. It’s kinda nice, maybe we should keep it on him all the time… just kidding, of course. His front paw is healing up nicely, though he has figured out that he can stretch his leg out, wrap it around the base of the cone, then push forward onto the floor or bed (yes, with his face) trapping his paw under the cone allowing him to lick part of it. He doesn’t do it often, though.